The students took the unit assessment this week. 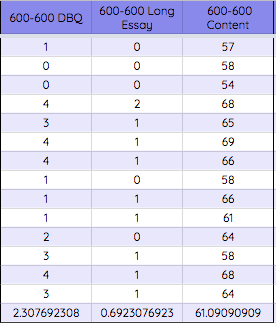 At the beginning of the year I mentioned that I created my assessment plan for the year. Each unit I was going to test each skill in each unit. However, the students were already going to test over two days to finish the writing and the multiple choice portions of the test. Therefore, I elected to not get feedback on the short answer. The students will have a lot of opportunities to get/give feedback on those skills in the next unit. 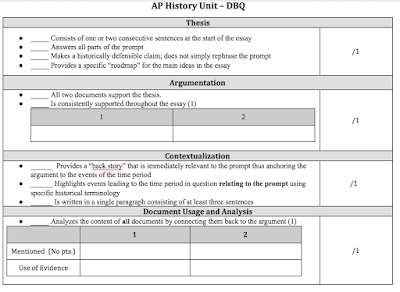 The DBQ was out of four possible points. Eventually it will grow to be out of seven. The long essay was out of two possible points. Eventually it will grow to be out of six. The content was out of seventy. So what does it all mean? 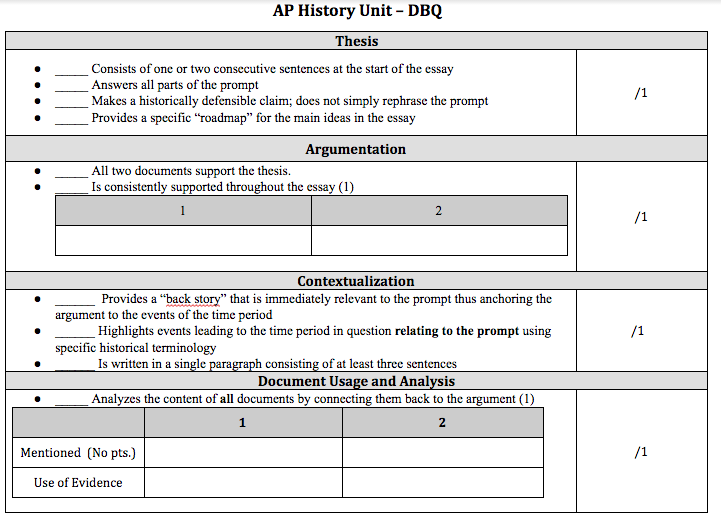 The DBQ went extremely well. At this point, the students average about the same as my students from last year in May. The global average for ALL of the students who took DBQ across the world was 1.8/7. So, the fact that my students have mastered a few of the smaller skills that will hopefully yield greater success in the months to come is a great result. The same went for the long essay. There were some struggles and some of the students are still have trouble. But their overall progress is great! 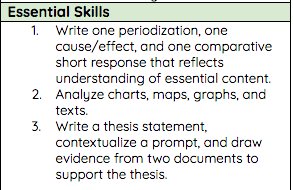 I focused on just the thesis and context this unit and the students have made impressive progress towards mastery. The content test was just basic factual recall. 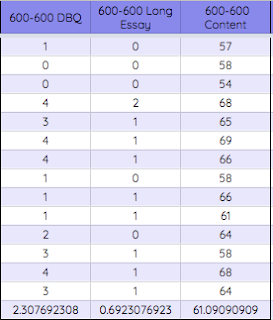 For the most part students mastered a number of the content objectives. The students struggled with Buddhism and its diffusion. That is an area that I need to go back over and the students need to spend more time with. But overall, they have a firm grasp on the content. To see whether or not they need how they were doing, I created a document in Notability to have the students grade bunch to see if they knew what samples met expectations. It enabled them to see if they knew what mastery looked like. I am excited for how the year is progressing. There are areas of need, but I know those areas and so do the students. It was a great benchmark and I am glad I dropped the short answer. I would have over tested the students and they would not have been able to process the information in their reflection. I am looking forward to the next unit and seeing how far the students can grow!